LimeRoad.com has come up with Buy 1 Get 1 Free offer in this Diwali occasion. This Buy 1 Get 1(B1G1) offer is available across most of the categories like kurtas, sarees, dresses, festival wears, accessories, tops, bags, footwear, pants, kitchen products, home decor, furnishing and so on. LimeRoad has different lifestyle products across categories like apparel, accessories, home and non-perishable food. Buy 1 Get 1 Free. Buy 2 Get 2 Free. Buy 3 Get 3 Free. When you buy 2 products, product with lower price will be free for you. This offer is valid only on products marked as 'Buy 1 Get 1 Free'. How to avail this LimeRoad Buy 1 Get 1 Free Offer? 1. 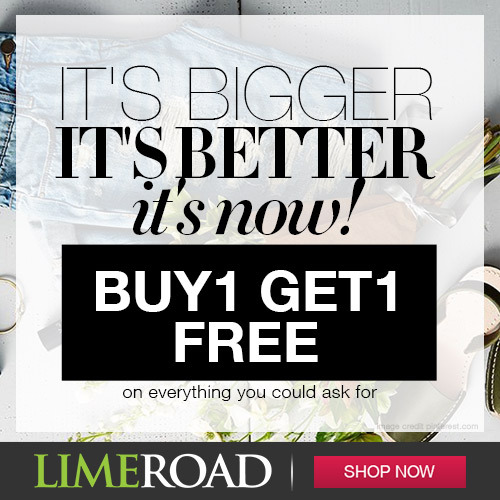 Visit LimeRoad Buy 1 Get 1 Free offer page here. 2. Add 2 products in your cart. The product with lowest price will be free for you.